How did you first learn to foster a relationship? For 27 year old Jeremy Tannehill, Executive Chef of Public House, it was in the kitchen. At the age of eight his first food memory was plain and simple, his mother's garlic and Parmesan butter noodles. Before he entered 4th grade he was the fajita guy. "I'd help make dinner for my mom when she got home from school," recalls Tannehill. From there it was watching his grandpa experiment with green bell peppers and quality meats. His father? Wings soaked in soy sauce. Flavor profiles have always been a point of interest for Tannehill who later went on to college in hopes of becoming a philosopher, then a lawyer. Throughout his schooling he worked in several kitchens and became a lot more interested in just the food. "Interaction. With the other cooks, it's different. You have the opportunity to create strong relationships, more than just the obligatory here's how you do this and here's how you do that. If you can fashion a good marinade, but can't communicate and have a little fun, how successful are you really?" Tannehill quickly realized that cooking didn't have to be just a hobby, he had a real passion for it. "When you really care about something you work not with the priority of gaining recognition, you do it for the people around you." He soon dropped out of his program to attend The Culinary Institute of Chicago while getting a job on the side as a dishwasher at Citizen Bar. 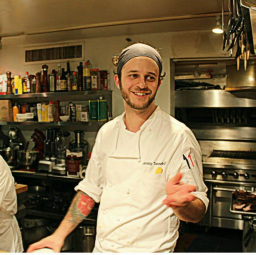 Over the next six years he had grown from a small, but essential role, to the Executive Chef. Currently he holds the position of Executive Chef at Public House where he was able to cook alongside the rest of his DineAmic Group family at the James Beard House in New York last year. His two cents on the craft? "Simplicity, don't over think it. When you think you have a good recipe, cut off five ingredients."